If someone had told me that in my 30’s I would fall in love with Jesus, I would have looked at them like they had lost their minds! Add living in a live, small town and leading weight management and exercise groups at my church? I would have said “Never”! His ways are not our ways and His ways are always perfect. After a childhood of being the chubby kid, obese by my teens, I didn’t believe being at a healthy weight could be in my future. I’ve recently given this unusual outcome significant thought. Many people have no weight issues growing up and experience weight gain after having children and in mid-life. My story is completely opposite. I was heavy until after children, discovering my gifts and passions closer to age 40! Not a citizen of this world, my life has been opposite the world in many ways. The glory is all His. None of this was thought up by myself or done in my strength. I began a Christian weight management program in 1993, and had intended to keep it a secret. After multiple failures in losing weight, only to regain it, I didn’t want anyone to know, even though it was different this time. God was a part of this journey and I did have hope, but not enough to have an audience! The Lord put me in the hot seat of leadership right off the bat. He knew I needed the accountability, and that I wouldn’t quit when the going got tough. It did get tough in the second year—with a loss of 7 lbs. The first year I lost 80 lbs. and it almost seemed easy. The weight came off week after week; the numbers on the scale dropped and so did my clothing size. The second year was discouraging, but the commitment to my group brought me back each Monday night. Judy joined our group after moving to our area. She and her family had lived in Singapore for 5 years, and during that time she had joined First Place and succeeded at losing weight for the first time in her life. She wanted Christ- centered accountability and our group was the only one she had found. It wasn’t until a year or two later that First Place changed publishers and I discovered the book First Place: Lose Weight & Keep it Off Forever by Carole Lewis. That little book changed everything. We officially began FP4H in January 2002. It has been an “out of this world” adventure as a FP4H leader! I have not only reached a goal weight I never imagined, but have grown spiritually through the Bible studies and disciplines of FP4H. I have met people from all over the country, and have support and encouragement like I’ve not experienced anywhere else. The framework in FP4H has provided the structure, encouragement and guidance (I needed) to become the woman God created me to be. I have been stretched, challenged, prayed for and given a “kick in the pants” when I needed one! I have an accountability partner and she has my back. She loves me enough to tell me what I need to hear, even if I may not want to hear it! The physical changes have been nothing short of a miracle and I’m grateful. 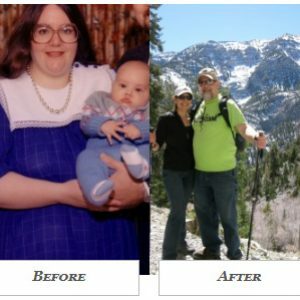 My total weight loss is 165 lbs. from my heaviest, (many years ago) to my current weight that is less than when I was in the 7th grade. God has healed me emotionally, challenged me mentally and continues to grow me spiritually. FP4H is a biblically solid ministry, provides all of the tools, love and support to help anyone overcome any obstacles they may have. Say yes! Trust God to be with you every step of the way, and get ready for the adventure He has for you! Check out Jenn’s video testimony on our YouTube channel, https://youtu.be/XchTTuzaqr0.